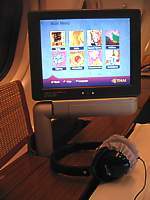 News: Thai Airways are adding video on demand for all classes, and giving personal video screens in all cabins. The roll out of this is slow. 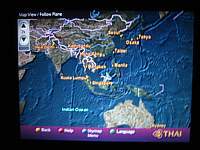 Whether you get a seatback TV on Thai Airways long-haul flights depends on the type of plane you are on. Entertainment on Thai is rapidly improving - although that is hardly a compliment, as it used to be notoriously woeful. Now, it's a bit of a gamble. You'll either get a video screen at your seat, and films you can play, pause, and rewind at will - or a projection screen at the front of the cabin, and that's it. The airline is one of the last in the world to phase out big projection screens at the end of each cabin - even in business & first class (what Thai used to call its "Mainscreen" system). Slowly 747, 777 and A340 aircraft are being retro-fitted with a film on demand system (AVOD) and getting personal video screen in the seatbacks - however Thai will take several years to fit out all its fleet. Economy either has projection video screens at the end of the cabin, with 3 films on most long-haul flights, which tend to be of a very bland, US orientated nature. Alternately you may get lucky, and get a plane that has been fitted with AVOD. In this case there is a small video screen in the seatback (or on a flip out TV screen for the bulkhead & emergency exit seats). 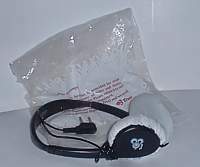 Small headphones with an overhead band and twin jackplugs are used in economy. Business is a bit of a gamble, as some planes (notoriously, the MD11s, but also a few 747s) still have a projection screen at the end of the cabin. Some of the fleet, mainly the 747s, have with personal video screens just in business, with 9 films. And of course on the latest planes to undergo a revamp, there is AVOD. Large headphones with an overhead band and twin jackplugs are used. These have strange cloth covers that always seem very grubby. However many flights which haven't been revamped, including all the MD11s, are still stuck with just the same overhead projection screen as used in economy. First there are two options. 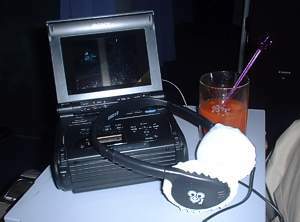 Older planes get a lovely little personal video player (using tapes, not DVD), with a great screen and fantastic sound on the MD-11s and the older 747s (Occasionally these personal video players are offered to passengers in business). In First with AVOD on the A340 and 747s, the screens come out and flip from the wall cupboards. They are touchscreen, and work well. Alas, the headphones are still dreadfull (and non noise-cancelling). Film selection can be a bit varied. Forget arthouse flics - we're talking mainstream Hollywood productions all the way here. With mainscreen overhead video you will get very bland films. On early model flip out screens (747s in Biz only) there is only an option of 6 English Language films. There is also one each of films in Italian, German, and French, and Thai - although all of these frustratingly tend to be US movies that have been dubbed, so you can watch, but not hear, the film you want to see. AVOD offers much better options, but it's still a way away from some of the better airlines like Singpore that offer many more films. On a plane with AVOD there are 9 films, most of which are pretty good, although a few months behind mainstream release in US, and quite a few half hour TV programmes. There are also some primative video games, and an inflight map. The film listings are contained in the magazine Thai Vision. The first four pages contain the Mainscreen listings, with each sub section either from or to Bangkok. The next 4 pages list the channels for business where there is a personal video screen. Again you have to look up your from and to locations, and then cross reference the channel numbers. There are then pages of film reviews. Right at the back are the lists of the Personal Video Movies. 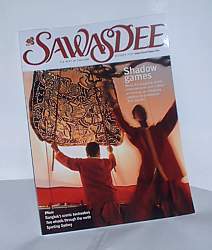 Thai's inflight magazine is called Sawasdee. English language, with just one page of Thai, it has the usual inflight offerings. A page on events in Thailand, with a featured bar, a page on Bangkok arts, three travel articles to places Thai flies to, and some of the largest print in the ugliest font you've ever been unluckiest to come across. At the back is a Welcome Aboard section, with information on the airline, including some photos of First just to annoy the customers in cattle class. Right at the back are pages of maps, which are more detailed than most airlines deliver.